God didn’t deliver us so we could stand still. That was my take away from a verse I meditated on this week as I posted it on Grow Barefoot social media (Facebook, Twitter, Google+). The verse was Psalm 56:13. A lot of us are content standing still. Hey, at least we aren’t just sitting in a pew – we’re standing! We serve a little in our churches, we pray occasionally, maybe open a Bible sometimes on a day other than Sunday, and pretty much try to live a good life. Sometimes we go a little crazy and put a Christian calendar on our desk at work or a Christian bumper sticker on the back of our car. They fit in real nice between the chrome fish and the stick figures of our family members. It’s all good. We did those things five years ago, and if God doesn’t return, we’ll be doing them five years from now. And ten years. And twenty years. We’ll keep doing them and never stop doing them because we’re standing still. So, in the midst of all our standing around, in comes a verse like Psalm 56:13, “For You delivered me from death, even my feet from stumbling, to walk before God in the light of life.” It invades our comfy little standing-around gathering and reminds us all what God did for us. It even has the nerve to go a step further and point out an appropriate response on our part. Psalm 56:13 is the conclusion of a brief Psalm written by David when he was in dire circumstances. We have to consider the whole thing to fully understand David’s conclusive call to action. David is in the midst of his enemies; the Philistines have taken him captive. He knows his life is in danger. Fear overwhelms him despite God’s promise of a future kingship in Israel. The Philistines gasp and pant for the opportunity to crush him. They can almost taste his destruction as they know his defeat will bring them victory against the Israelite army. In their arrogance, they actually think they can stop God’s plan (Psalm 56:1-2). David’s afraid – very afraid. He didn’t allow fear to paralyze him, however. He didn’t let it control his thoughts, actions, or emotions. As waves of fear came over him, he purposely chose to place his trust in God. That’s not a normal human response; David must have had enough life experience by this point to discipline his response to fear. He knew to trust, not panic or doubt God’s promise. After all, he had the very Word of God – a promise given through the prophet Samuel – that God had a future for David. In response, he could quiet his fears, assess the situation, and proclaim to his captors, “What can man do to me?” (Psalm 56:3-4). The Philistines didn’t come at David in only one way. They attacked him relentlessly from six different angles. They tortured him with words as they twisted and distorted the truth to which he clung. They schemed and connived every sort of evil against him. His enemies gathered together under a common cause of stirring up strife in David’s life. They hid themselves away in the deceptive shadows. They watched him from those shadows. As they schemed together, hidden and watching, they panted for a chance to crush and destroy him (Psalm 56:5-6). The stage has been set, David’s attention has been focused in the right direction, and the enemies are scheming their evil plan. With that, we reach the climax of the Psalm. “Will they escape in spite of such sin?” David’s trust in the surety of the Word of God empowers him to prophesy his enemies’ demise – God will bring them down. Their outcome is certain. David’s outcome is different, though. The same Word that promises the destruction of the enemies of God’s chosen people promises a future for those He has chosen. 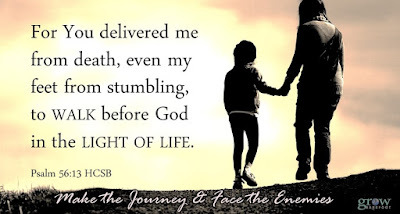 For them, God has a record of our walk… our journey… our wanderings. He has our tears preserved in a bottle. Our whole walk, including every tear, every moment of fear, every rejection, and every attack by the enemy, is recorded before God’s throne (Psalm 56:7-8). David’s enemies imprisoned him; his situation looked bleak. Yet, he knew God’s Word and therefore he knew the outcome that awaited. He didn’t cower in fear. He didn’t stand still. He rose up against his enemies. He called out to them knowing they would retreat because he also knew that God was for him. He didn’t need to know the details. He only said, “This I know: God is for me” and that was enough. Not just any God either. When David entered his dire situation and fear threatened to envelop him, he relied on the Word of God. He trusted the Word and even reached a point of praise in his prison. By the end, though, he had grown. He found victory from the threats and evil intents of the Philistines. He experienced the comfort and compassion of a God who keeps each of our tears in a bottle. He put God to the test and found Him faithful. The experience of his journey led him to add a new line to his song of praise. He not only sang “In Elohiym, whose word I praise” but now the victory of his test leads him to sing, “In YHWH, whose word I praise.” Yahweh, Jehovah, the one and only true God was the source of David’s victory and assurance for the future. With even more confidence and power, I believe he loudly dared any who might rise against him, “What can man do to me?” (Psalm 9-11). We’ll never make that walk if we keep standing still. What might happen if we start walking? We'll become healthier, stronger, and we'll start moving forward. Click here to read more.